It has been estimated that there are about 400,000 workers in Singapore who earn $1,000 or less a month. What are some of the low wage vocations? 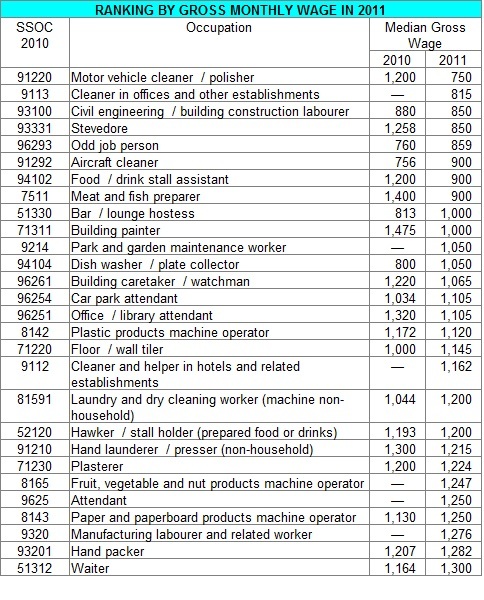 The following table shows the common vocations with gross monthly wages of $1,300 and lower as at June 2010 and June 2011. No data were available for some vocations in 2010 presumably because such vocations were not surveyed or the number of persons surveyed was too small. The median gross wage for each vocation does not tell the whole story. Half the number of persons surveyed earned less than the median, by definition. The following table shows the same vocations with the monthly wage at the first quartile (or 25th percentile), median and third quartile (or 75th percentile). The Ministry of Manpower's Occupational Wage Survey covers a representative sample of private sector establishments with at least 25 employees. Establishments with fewer than 25 employees are not included. It is not known how many resident employees are employed by private sector establishments with fewer than 25 employees and how their wages compare with the wages of employees in establishments with at least 25 employees. 1. Ministry of Manpower Report on Wages in Singapore 2010. 2. Ministry of Manpower Report on Wages in Singapore 2011. 3. The wage data were obtained from Occupational Wage Surveys 2010 and 2011 based on a representative sample of private sector establishments with at least 25 employees each. Apprentices, trainees, temporary workers, part-time workers, piece-rated workers and workers who did not work the entire month of June 2010 or June 2011 were excluded. The basic and gross monthly wages exclude bonuses and profit sharing of full-time employees who contributed to CPF in the month of June 2010 and June 2011, respectively. 4. Changes in occupational wage levels over time reflect not only wage increases paid to the workers but also the changes in composition within the occupational group. Data may also fluctuate year to year due to sampling variability. 5. A comparison of occupational wages with earlier years would have been more informative but was not presented because the detailed standard for classifying occupational wages may have changed. 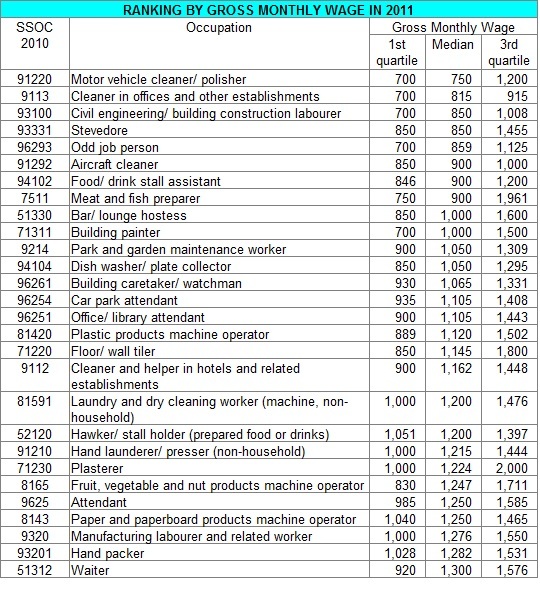 Occupational wages for 2005-2009 were classified using Singapore Standard for Occupational Classification 2005, while occupational wages for 2010 and 2011 were classified using Singapore Standard for Occupational Classification 2010.